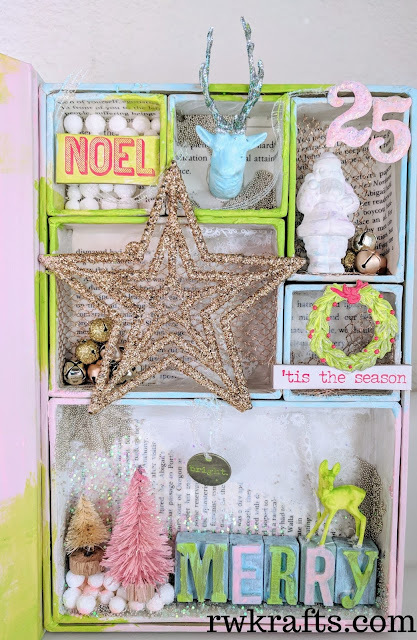 I kept the box bright and airy with light pastel blues, greens, and pinks. I also reused a lot pretty ribbon and gift wrapping decorations... I always save them for things like this! 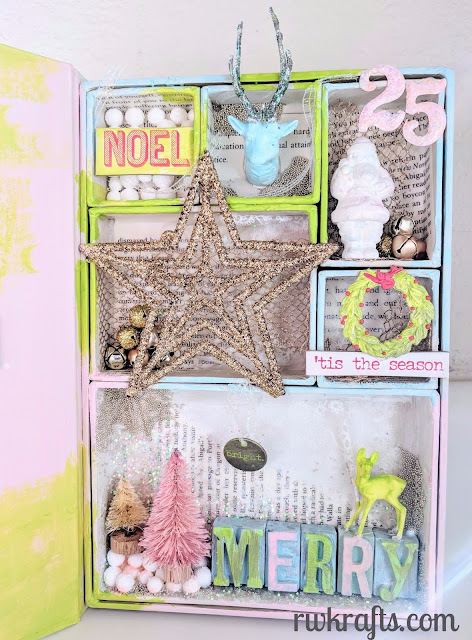 Lots of gesso, distress paint, and glitter involved in this project! 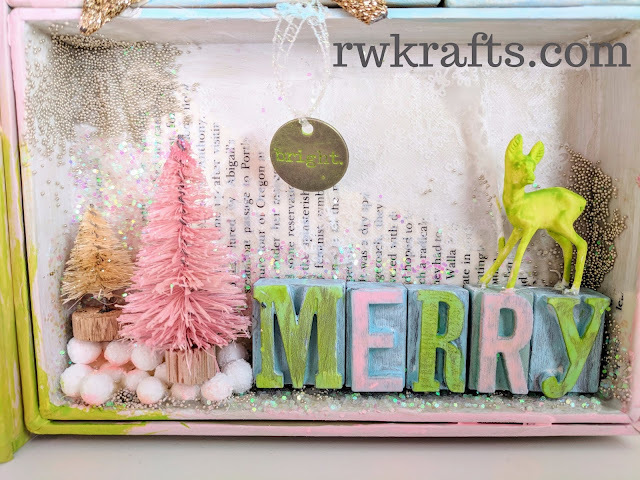 For every individual box I started with a thin layer gesso, then added a thin layer of book paper with matte medium, and some either got a glitter treatment or a pretty gold ribbon added. 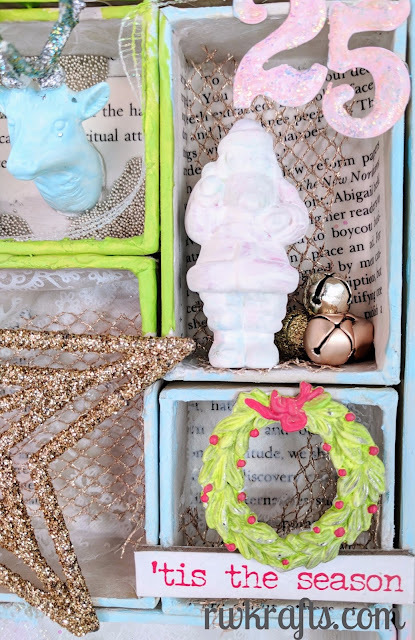 The MERRY blocks were painted with Distress Paint in Spun Sugar, Tumbled Glass, and Twisted Citron. The little deer and the 'bright' charm were painted with Twisted Citron. The little tree and snowballs were colored with Spun Sugar. 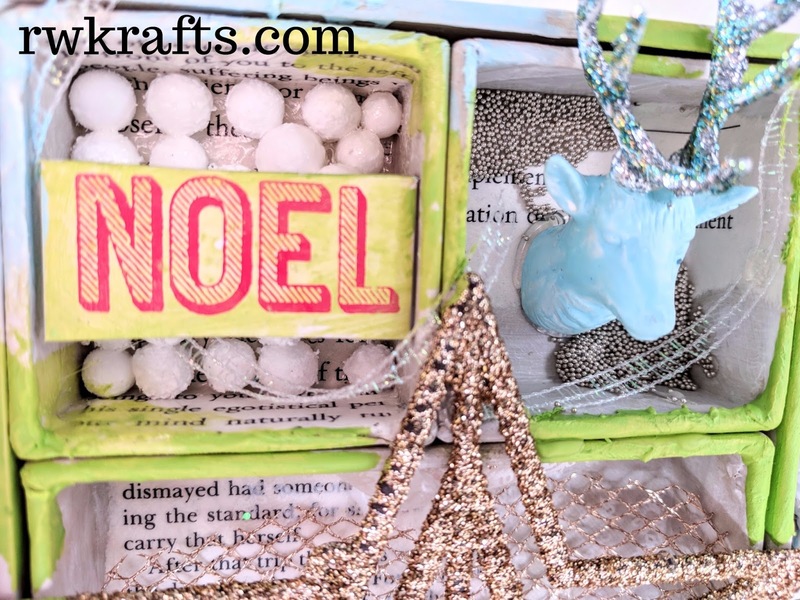 I add everything with a HOT GLUE GUN! I cannot stress that enough... don't waste your time waiting for glue to dry, just hot glue those suckers. 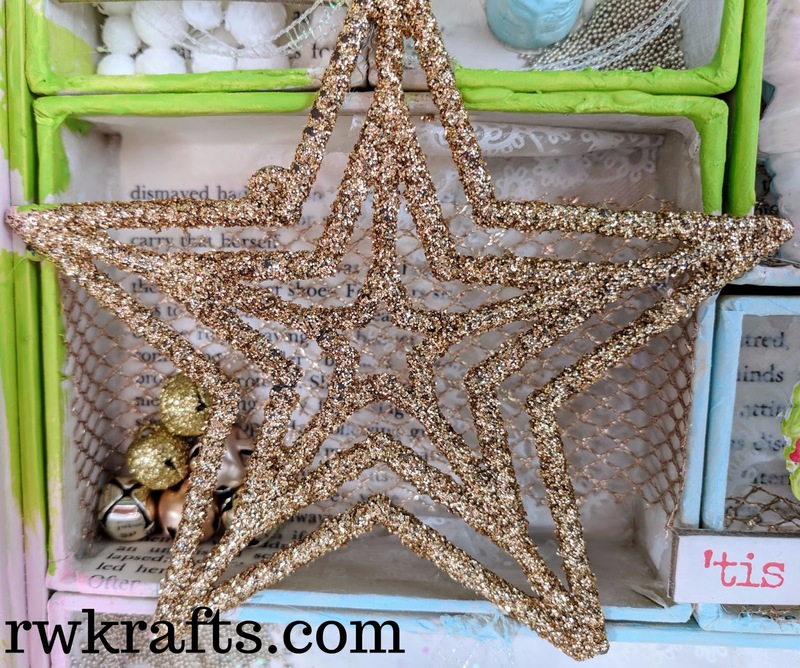 The centerpiece of the configuration box is actually this gorgeous star that was tied around a gift tag that I received. 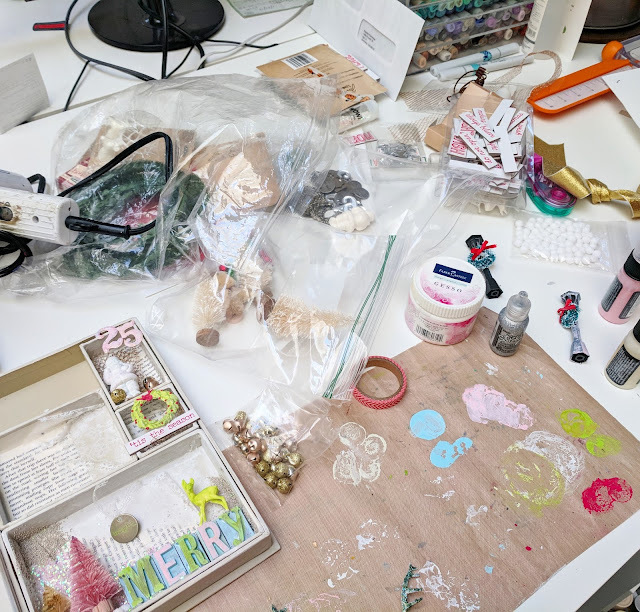 You can see the gold ribbon in the back (also hoarded from old gift bags) and some gold and silver mini jingle bells. With the pack of holiday greeting chipboard pieces I added the NOEL which I also painted in Twisted Citron. 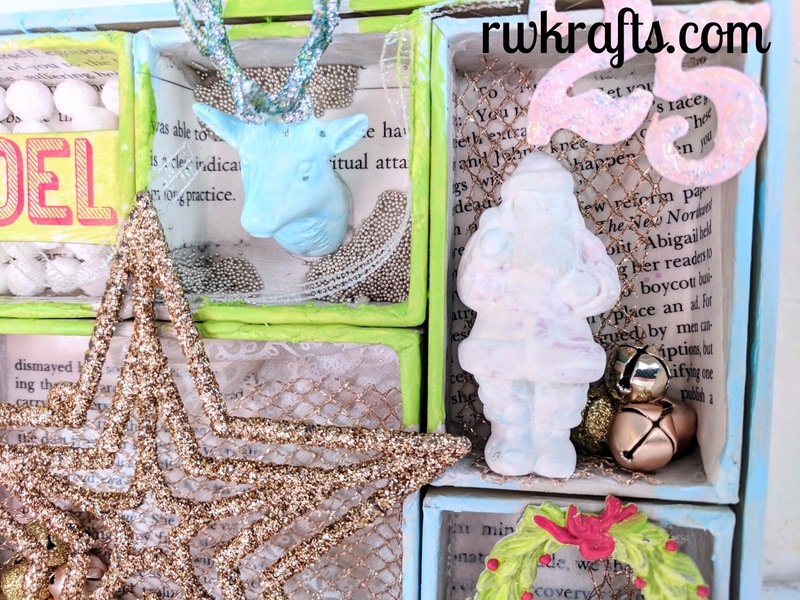 I raised it in front of a layer of mini snowballs and you can also see a pretty iridescent ribbons flowing between the boxes. The reindeer got a layer of gesso, then some Tumbled Glass paint, and A LOT of layers of Stickles on the antlers. The Santa Claus was the most tedious part of the entire box... but that's only because I couldn't make up my mind on what color I wanted him to be. After 3 layers of gesso and paint, gesso and paint, I finally just decided to keep him white... good enough for me! The metal numbers were of course gesso'd and painted with Spun Sugar, then received a generous layer of Icicle Stickles. I love this little metal wreath! It was painted with Twisted Citron and Festive Berries. Thanks for joining me! Have a very Merry Christmas!